Computed radiography (CR) uses phosphor-imaging plates instead of film to store radiographic inspection results. The plates are exposed as per standard radiographic testing, but the images are laser scanned from the plates into a computer system. Using powerful software one can then analyze, manipulate, print and store the images for future review. The remaining wall thickness can then be determined for corrosion evaluations and ASME code radiograph interpretations. ASME Code Case 2476 now allows the use of CR for all ASME work. Computed radiography can be performed on the same materials and in the same situations as standard radiography. The component thickness limitations are the same as for standard radiography. 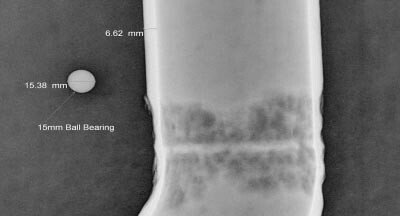 The practical limit for carbon steel gamma radiography is approximately 2.5″ for Iridium 192 and 9″ for Cobalt 60. With x-rays, the x-ray generator energy determines the maximum thickness penetrated. Radiation safety considerations are as fundamental for CR as they are for standard radiography. Large areas adjacent to the component tested must be cleared from persons or items that may be affected by radiation. The use of CR results in a reduction of exposure times from 50 to 70% when using Ir 192. Similar, or better, results are obtained when utilizing Se 75, Co 60 and X-rays. CR is well suited for low curie strength sources or small contained area radiography devices that require less area to be roped off. The much greater dynamic range of the imaging plates practically eliminates re-shots by providing a much greater range over which exposures can be practically done. CR is performed in the same manner as standard radiography. A qualified radiography technician requires minimal training when implementing CR field applications. However, unlike standard radiographic testing, the CR film does not require development chemicals and water. CR has some of the same requirements and limitations as standard radiography. Images obtained by CR show discontinuities in two dimensions only, and require access to both sides of the subject material. The equipment reading station is required to scan the imaging plates. Consequently, physical space and on-site electrical power are required to set-up the equipment. In some projects, the imaging plates can be transported from the job site to the reading station, but this is not often the case. Some additional costs may be associated with using CR. 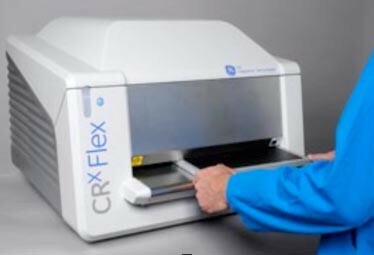 The CRxFlex, in conjunction with the GE’s Rhythm software, allows users to acquire, review, report and archive inspection data. The DICONDE-compliant Rhythm platform also permits image enhancement and data sharing to provide significant improvements in productivity and faster identification of defect indications are given to the customer with findings/ comments on the actual images.